What does Tooth Enamel Exactly do? 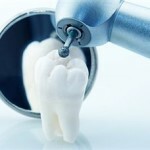 You know that you need to take care of your teeth and protect them from the development of plaque and cavities. But did you know that our teeth have their own natural protection? Tooth enamel is a type of tissue that coats the exposed parts of a tooth and it is one of the toughest substances in a person’s body. The strength of the tooth enamel comes from the many minerals that it contains. Tooth enamel is also semi-translucent, meaning the coloration of tooth comes from the dentin which is underneath the enamel. It coats the top crown of the tooth and serves as the primary defense of our teeth against bacteria. However, tooth enamel is not exactly indestructible. The types of food we eat can affect the strength of our enamel. Tooth cavities dissolve and destroy enamel by stripping the minerals that make it strong. One of the primary causes of tooth cavities is the consumption of sugary foods and acids. Sugars feed bacteria, and as bacteria work hard to propagate, they release acids, thus destroying enamel. Because of the importance of tooth enamel in the protection of teeth, you need to take steps to protect it as well. Fluoride is one of the best ways to do that. Fluoride helps restore the lost minerals of the enamel and reinforces it. There are many natural sources for fluoride and a good example would be water. By regularly drinking and swishing water in your mouth, you can help wash away food debris and bacteria. Once tooth enamel is destroyed, that leaves our teeth exposed and vulnerable. Having said that, most toothpastes today have been formulated with fluoride. So remember to brush your teeth daily because that can greatly help maintain the enamel of your teeth. If you’re not sure how strong your enamel is, or if you would like to learn more about how your dentist can help protect your tooth enamel, contact Greenline Dental Centre.